Viking Cruises sold out its inaugural world cruise aboard the new Viking Sun with 900 passengers booking the entire voyage last year. The current 2019 world cruise has 463 passengers onboard for the entire 127 days, and 16 of them are Australians. The reason for this decrease in full-voyage cruisers may be due to the large number of sea days -- with some sectors comprising seven or eight consecutive days at sea. Boarding in Tahiti and disembarking in Auckland, we joined part of the ‘Islands of the South Pacific’ itinerary, which departed from Valparaiso, Chile on February 12 and ended in Sydney on March 16. Among the 830 passengers on this itinerary were 42 Australians -- a healthy number for a cruise line that is relatively new to our market. This 31-night sector was the longest and also had the most big blocks of sea days – some that were scheduled and others that were not. Passengers unexpectedly spent 11 consecutive days at sea when the visit to Easter Island, planned for February 19, was cancelled due to rough seas. Instead of ferrying passengers ashore by tender, Captain Lars Kjeldsen circumnavigated the island, which provided a decent compromise even though the famous statues, known as Moai, could not be clearly seen. As the Moai face inwards, passengers had a distant view of their derrieres and not the elongated faces and prominent noses they are known for. Everyone was eager to disembark in Papeete on February 25, a half-day ahead of schedule. Having made up time, the captain decided to overnight in the Tahitian capital, giving passengers almost a full day in port. While not held at the exact moment when Viking Sun crossed the International Dateline, a fascinating ceremony marked the occasion. It was originally planned to be celebrated at 5pm on March 3 around the Deck 7 pool, but as we woke to rough conditions that morning (having completely lost March 2 to the vagaries of longitude), the event was postponed until the weather improved. Many people took to their cabins by day, emerging only to have dinner. Others loved the high seas, and the Chef’s Table degustation restaurant was buzzing. The next day saw the smooth running of this rather unusual ceremony, known as the Domain of the Golden Dragon. As the Viking Band played and snacks and champagne were served, cruise director Heather Clancy read out an old mariner’s oath that ceremoniously inducted us into the mysterious Golden Dragon’s domain. Those who had birthdays on the missing March 2 were also invited up to the stage as we sang Happy Birthday. The Domain of the Golden Dragon is an unofficial United States Navy award, given to crew members of ships that cross the date line from east to west. By crossing in this direction ships enter Asian zones, where in Chinese legend the dragon is a symbol of power and strength. Although it’s a naval tradition, several cruise lines celebrate the event, but without awarding certificates to crew (as was the tradition on naval vessels particularly during World War II). Parties are hosted regularly for the various special occasions throughout the sailing. Aussies on the first sector of the voyage were treated to an exclusive event in the Wintergarden lounge to celebrate Australia Day. Celebrations are also planned for Anzac Day next month, when the ship will be cruising the Atlantic Ocean off the African coast. Australian jazz pianist Kym Purling was one of 10 entertainers from Viking Sun’s 2018 World Cruise who have been invited back this year. Purling, who was born in Vietnam during the height of the war and adopted by an Adelaide couple, has been performing on cruise ships for the past seven years. Classical guitarist Tom Ward, from Tasmania, has also been a hit with passengers on this sector. Ward, 35, has played on stages across the world, busked at the Adelaide and Edinburgh fringe festivals; this was his first gig on Viking Cruises. Many crew members have been happy to talk about their life on board. As they are provided with free Wi-Fi and free flights back to their home countries, they all sang the praises of Viking. Passengers who have any leftover onboard credit often “gift” their credits to their favourite crew members. These gifts can be in the form of a spa treatment or item from the onboard boutiques. Gifting happens fairly often, because Viking’s largely inclusive fares mean many world cruisers have very little to spend their credits on. The fourth sector, a 25-night voyage from Sydney to Durban, promises more days at sea but also three overnight stays in major cities. 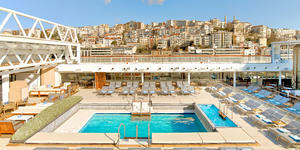 After two overnights in Sydney, Viking Sun heads for Fremantle for an overnighter. Then it’s a long haul of eight sea days across the Indian Ocean to Mauritius. 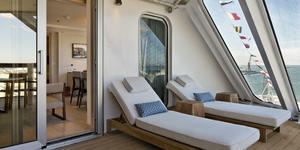 When the ship arrives in Durban, South Africa, passengers will be treated to two nights in port. Viking Ocean Cruises 2020 world cruise is on sale now.